Woven Baskets Discounts Apply ! The Woven Willow Basket Trio is a great storage solution for the nursery. 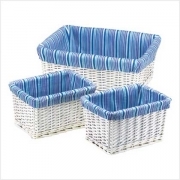 Whiite woven willow baskets are lined with snappy blue-and-white-striped fabric for a bright, clean look.